I'm slowly finding out that Bolivian rosewood is really hard to work. Not only is it dense, but it tears easily and it blunts the edge of the tools fast. But it rings with a ping and it looks nice and has a very fine texture. 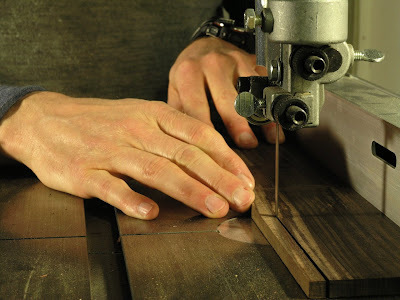 The fingerboard blank was quite oversized and had to be trimmed a bit before any actual work was done. First it was cut to width +1/16" on the bandsaw, which left a nice long stick 3/8" square that can potentially be used as fingerboard binding on a future build. Next the length was trimmed, also on the bandsaw. I clamped the fingerboard blank onto the shootingboard and straightened and trued one of the sides to the flattest surface with a jack plane. The plane was fitted with a 50º bevel blade which virtually eliminated all tearout when it was set to a very fine setting. I deliberately left the other edge with sawmarks so the two edge were easily distinguishable as I wanted to use only one edge to cut the fret slots from. 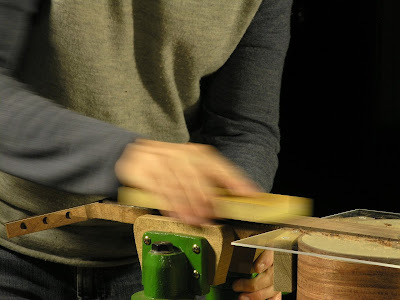 Last the ends of the fingerboard was trued to the finished edge with a low angle block plane. I had to do the surfacing with a scraper plane. Even with a high blade angle the interlocking grain of the dense wood was impossible for me to control. The fingerboard blank started off at 8mm thickness that I had to get down to about 6.0mm to keep it a little oversized for later alterations. I took quite some time to get it down but down it went. I had to sharpen the blade a good few times. 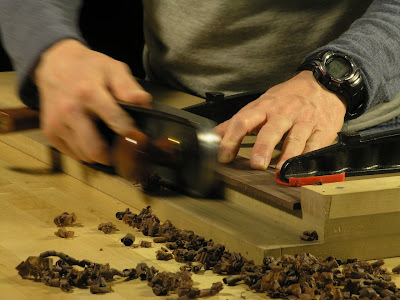 The Bolivian Rosewood seemed to eat the edge in record time making the blade very noisy and shrieking with every stroke. But, when it was freshly sharpened it took off shiny curls with a confident swooiiiiish, didn't tear and left a nice and smooth surface behind. Once the surfacing was done, I went over the edge and ends one last time to get everything true and square. In order to prevent the fingerboard from sliding around in the wet glue I decided to use four location pins to keep it in place during gluing. 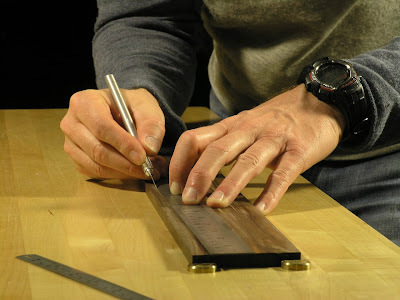 A center line was first marked with white pencil on fingerboard face and and for marks were made with a scalpel at the center of the location for fret no. 1, 4, 7 and 11. With a 3/64" drill bit that matched the diameter of the four brads that was going to hold the fingerboard in place the four holes were drilled on my drill press. I decided to do the holes prior to cutting the fret slot. I thought it would be easier to do it this way as the 3/64" drill bit was slightly wider than the slot. Had the drill bit been narrower, it might have been better to drill the holes after the slots were cut. The fret slots were cut manually, that is, with the use handtools only as I don't have any fancy jigs for this. I used a fretsaw, a square and a caliper for this as well as a wooden stop block. To find the first five fret slot locations I used the wood block as a stop at the nut end. I set the calipers to measure a distance equal to the correct fret location minus half the width of the fretsaw kerf. 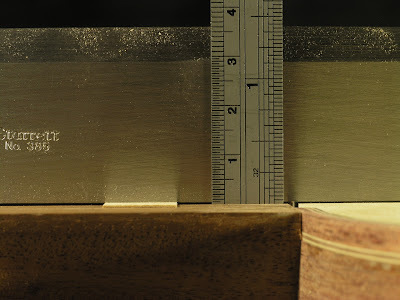 The protruding depth measuring blade was butted up against the wooden stop block and the square was butted up against the caliper's beam. 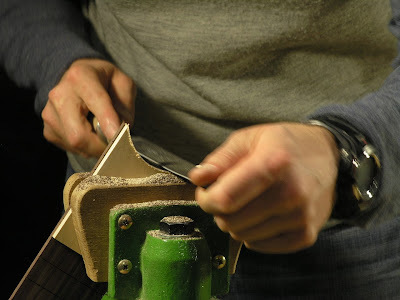 The first five fret slots was cut with the aid of the calipers alone. For the rest of the slots I had to make some sort extension for the depth measuring blade. For this I fabricated a 150mm long spacer bar that was ripped into two equally long pieces. 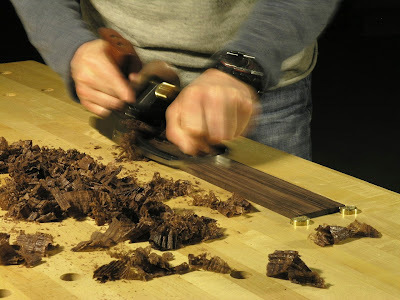 With the help of one bar inserted between the wood stop block at the end of the fingerboard and the depth measuring blade, the next eight slots were cut. The fret slots from 13 and onwards were done with two spacer bars in extension of each other. I had one mishap. I accidentally cut the second slot in the wrong position. It turned out that the beam on the calipers had a little rebate at the bottom, and I accidentally butted the square up against that rather than the bottom of the beam itself. I quickly thicknessed a piece veneer to fill the slot, glued it in and leveled it flush to the surface and edges and cut a new slot in the correct location. Prior to the cutting, I created a spreadsheet with the help of Liutaio Mottola's formula on fret spacing: D=S-(S/(2^(N/12))), D = distance from nut, S = scale length and N = fret number. The spreadsheet also included a column with fret spacing minus half the saw kerf width as well as a column taking saw kerf and spacer bars into account. This way I was able to read the measuring targets directly on the caliper display without having to make any further calculations. 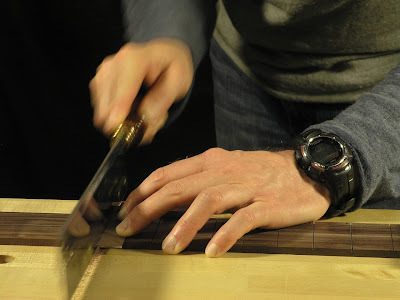 Because the neck meets the body at a slight angle, a slight taper had to be worked into the gluing surface of the fingerboard from the 12th fret and onwards. I propped up a straightedge on the neck with two shims of carefully thicknessed veneer to keep it level, one at the nut and one at the 12th fret, allowing the straightedge to just touch the edge of the soundhole. 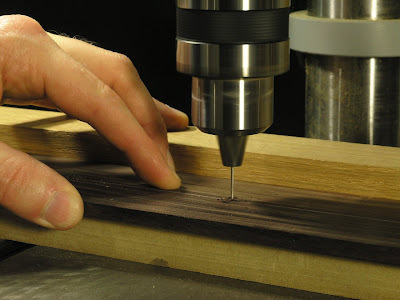 I measured the taper to be about 0.4mm or about 1/64", equal to the thickness of the veneer shims. The taper was done by scraping, mostly with a card scraper but I also used my large scraper plane to make sure the surface stayed flat. I proceeded quite slowly with this and did a lot of dry fitting to check the progress. It was quite a small amout that needed to be removed and I knew I could easily get carried away and take too much off. I'm growing more and more fond of using knives for marking rather than pencils. I find it creates a more defined line and allows me to do more accurate work. 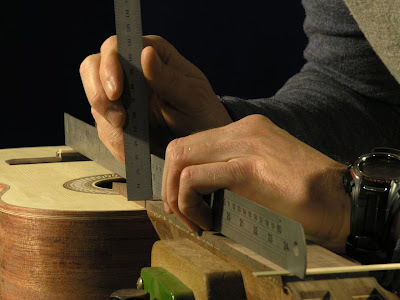 This was the case too when I set out to measure and mark the taper of the finger board. 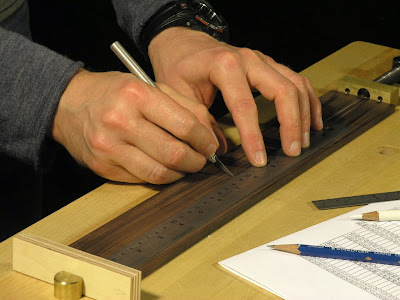 I first marked the center on each end and used that as reference to mark the width of the fingerboard, 46mm at the nut and 56mm at the twelth fret and scribes the two lines defining the outline of the fingerboard. With the use of the shootingboardand and my trusted low angle jack plane, I worked the waste away, first with the plane set at a rather coarse setting, then gradually setting it finer as the work progressed. 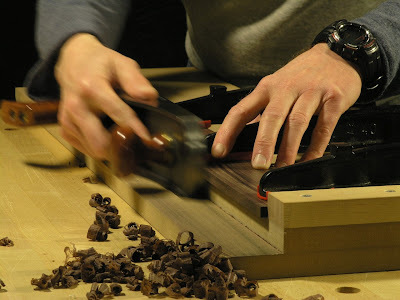 The last bit was done with the a very fine setting, similar to jointing the centerseam of the soundboard and back, by working from the middle down first and slowly lengthening the strokes until a full stroke would take of a fine shaving along the entire length. The fingerboard was then carefully clamped in position on the neck and the location pin holes were extended about 1/4" into the neck and the four matching brads were pushed in and driven a little further with a small hammer. 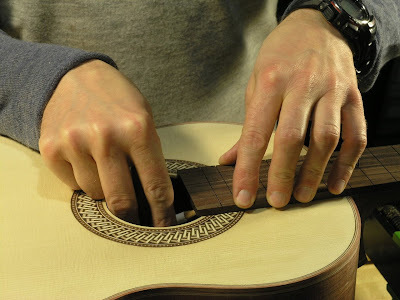 With my hand partially stuck throught the soundhol, the soundhole diameter was traced on the underside of the fingerboard with a white pencil. This was the first time I realized that the smaller soundhole of a 3/4 sized guitar could spell trouble for a pair of fully sized manhands. Luckily my hands are not that big and I was barely able to fit them through. Next up was cutting the waste away with a coping saw. As advised by Cumpiano I made a little piece of backing, a 1/4" thick oiece of maple in my case, to prevent tearout. This worked very well. The final shaping was done with rasp first and then with a a file. This was also done witht the maple backing on. As I wasn't completely satisfied with the fit, I decided to try out another cumpiano method, a sanding disc in a drill press to do the final fitting. I got a sanding disc made, covered it with some 120 Grit 3M stick-it paper and it all seemed fine. However, this turned out to be less successful. What I didn't count on was that a sanding disc will cut more aggressively where it enters the work. Unfortunately this only became apparrent after my first attempt to true the curve as a quick dry fit showed the curve had moved to one side of the fingerboard. Even worse, that side had been sanded to short. 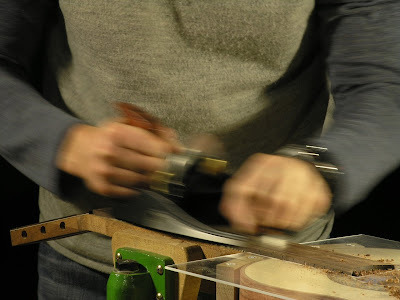 In the heat of the moment I saw only one solution to the problem; To sand the curve back in the middle again even though that would make the fingerboard about 1/16" short altogether. Well, that or start all over again with the fingerboard, but as the damage would only be cosmetic I chose to live with it. I am considering gluing a little piece of veneer on the end to get the fingerboard be flush with the soundhole, but the jury is still out on that one. 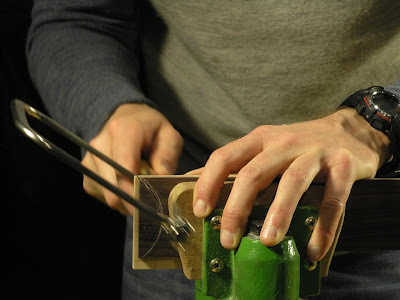 As the fingerboard already had been positioned and the location pins ready to hold it in place, the time had come to glue the fingerboard on. 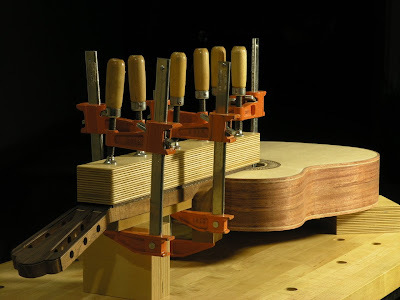 I had made a massive 1½" clamping caul out of plywood to go on top of the fingerboard as well as a caul for the inside of the soundbox from the 14th fret to the soundhole, that fitted around the upper transverse brace. A piece fo MDF was used as a caul on the underside of the neck and on the heel cap. First the caul for the soundbox was put in place with with some blue tape. 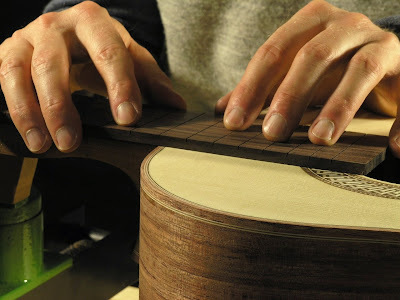 Again, I found it lucky that I was able to get a hand throught he soundhole to do this. It was a tight squeeze. 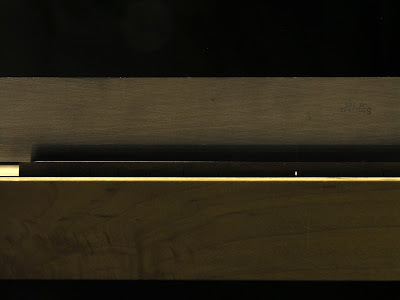 A fairly liberal coat of glue, regular titebond, was applied to the underside of the fingerboard, and the fingerboard was carefully put in place, and the location brads tapped in a little further with the hammer. Next the big caul for the top of the fingerboard was put on top and the first clamp was put on at the end, very lightly tightened to just keep the clamp in place. 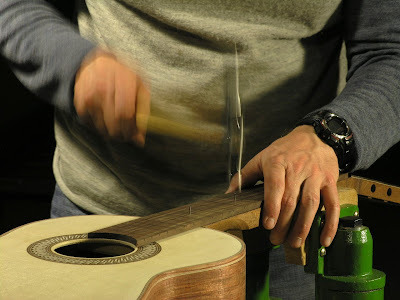 Next two bar clamps were attached into the soundhole. These were also only tightened very lightly. Next to go on was the middle one, around the 7th fret, then the last two, one around the 4th fret and one on the 12th. Once the clamps were all on. I checked the alignment of the fingerboard and made sure it hadn't been sliding out of place in the wet glue. Little by little the clamps were tightened in the same sequence, while checking the alignment after each sequence, until all the clamps were on nice and tight and the assembly was left to dry over night. I must admit that, at this point I stopped to make my bridge. 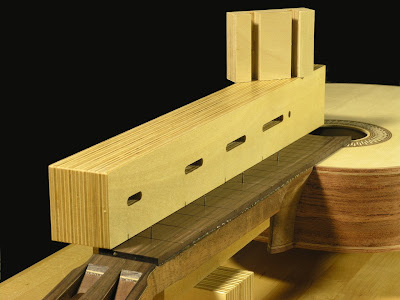 Instead of manufacuting a dummy bridge for fine tuning the fingerboard thickness to desired string height. I though I just as well make to real deal and use that instead. But I'll describe that process in the next post. For now I placed the completed bridge in the correct location fitted with a saddle protruding about 3mm. At the nut end I placed a 1.1mm thick shim to simulate the strings exit at the nut. 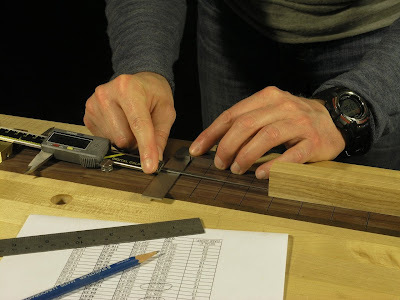 I placed a straight edge on top of the shim and bridge and measured the string height, including a fret, at the 12th fret. It came out right on the money, or at least close enough to the 3.4mm I aimed for using a ruler and the naked eye. With the straightedge I checked the flatness of the fingerboard again. I had aquired a few irregularities during the glue-up that had to be flattened. This was quickly done with my scraper plane on a very fine setting. I had made a little protective apron for the soundboard out of plexiglass that fitted around the fingerboard. Some builders keep the fingerboard flat throughout and adjust the string height by making a saddle that is higher on the bass side but I'm not keen on that practice. For one I don't like the look of it and I also suspect that having a higher string break angle will drive the bass more which is no a desirable feature on classical guitars, where the trebles often are the weaker component. Instead I started to shave off material on the bass side to lower it and thus create more string clearance, while leaving the trebleside alone, while monitoring the progress carefully on the treble side, the middle and the bass side, to ensure the fingerboard remaind flat along the string axxis. 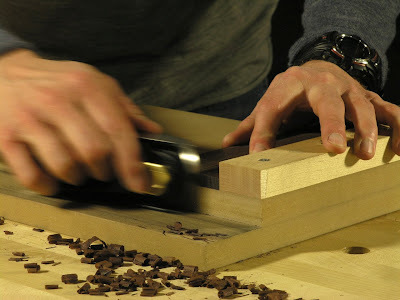 The planing was done with the scraper plane. Last I had to create a slight relief around the 5th-7th fret as this is where the amplitude of the string is greatest immideately after it is plucked, when played normally; Normally meaning with your right hand around the back edge of the soundhole. 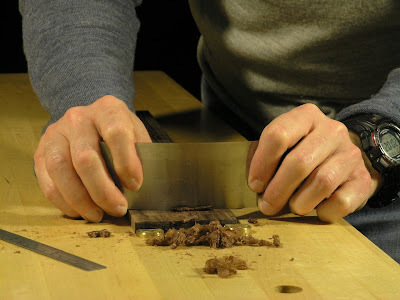 Unfortunately I couldn't do this with my preffered choice of tools, edgetools, and I had to resort to sandpaper. I used 120 grit 3M stick-it paper on a 3"x6" MDF block for this, and though it was a very dusty affair it worked well. I started sanding in small strokes around 5th and 7th fret and slowly took longer and longer strokes, measured the progress and repeated the process until a 0.5mm relief was in place and finished the job off with 220 grit paper.